For the example above, the Trellis chart shows first quarter sales. Each individual pane has the same X and Y axis, with Date on the X axis and weekly sales data on the the Y axis. That graph is then trellised showing Online and In Store sales on the Rows and Department Sales on the columns. This allows us to very quickly compare first quarter sales across multiple variables, all in a single graph. Create a new graph. Any chart type can be trellised. Graph your X and Y variables. Drag the column with your trellis column dimension to Columns. 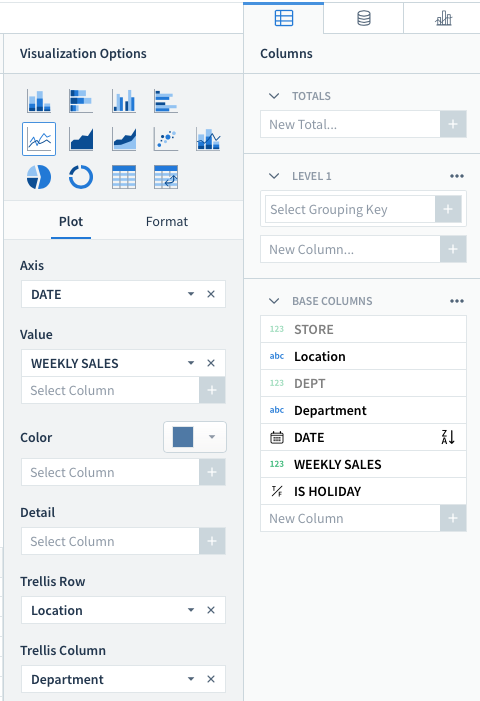 Drag the column with your trellis row dimension to Rows. To change how the trellis axises are displayed, the size of your tiles, and how the labels appear on the chart, click into Format and find Row/Column. Here you can also indicate if you would like each graph to have the same X and Y axises, or if each graph should have their own dimensions for the X or Y axis. Open Reference Lines and click + Add. Choose Which axis to add the reference line to. Choose if you would like a constant or calculated value for your reference line. For a calculated value, choose if you would like to calculate it as a Shared value or Per Chart. Shared values will show as the same on all of the individual charts in a Trellis Chart. Per Chart values will be calculated using the value for each individual chart in the trellis Chart.